TAIPEI—A surge of cash into Taiwan has sent stocks to their highest level since 2007, as enthusiasm grows over the island’s technology companies. Wednesday was the biggest single day for foreign buying since last July, as overseas investors snapped up a net 17.1 billion Taiwan dollars ($570 million) in shares. With recovering U.S. and European economies and new gadgets slated fromApple AAPL -0.35% Inc. and Sony 6758.TO +0.18% Inc. this year, Taiwan’s technology component makers are benefiting from their central role in the global electronics supply chain. Analysts expect a bigger-screen iPhone 6 later this year, while faster smartphones from other brands are set to increase demand for components from Taiwanese factories. “We’ve been adding new positions in Taiwan stocks…many of which are very well positioned to gain from electronic-product launches later this year, particularly the Apple products,” said James Yeh, a Taipei-based executive director of J.P. Morgan Asset Managementwhich in Asia oversees US$491 billion of assets. One big beneficiary is Taiwan Semiconductor Manufacturing Co. 2330.TW -0.40%, the world’s biggest contract chip maker by revenue and the largest listed company in Taiwan. It expects record revenue and net profit this year as it starts to produce chips for Apple, which is reducing its reliance on South Korea’sSamsung Electronics Co. 005930.SE -1.81% for components. TSMC shares, upgraded by analysts in March, have surged 19% this year. That has driven the benchmark Taiex up 8.2% over the same period. Thursday, the index rose 0.4% to 9316.81, the highest close since November 2007. “Those guys in an oligopolistic structure are doing very well,” said Khiem Do, head of Asian multi-asset investment at Baring Asset Management, which has $59.4 billion of assets under management. Mr. Do said he this year has increased his exposure to Taiwanese stocks, especially technology companies. Taiwan tech companies also offer a price edge, trading at around 14 times forward earnings, a common valuation measure, compared with about 16 times for U.S. equivalents. This makes Taipei’s tech stocks cheaper proxies for investing in the Nasdaq, fund managers said. 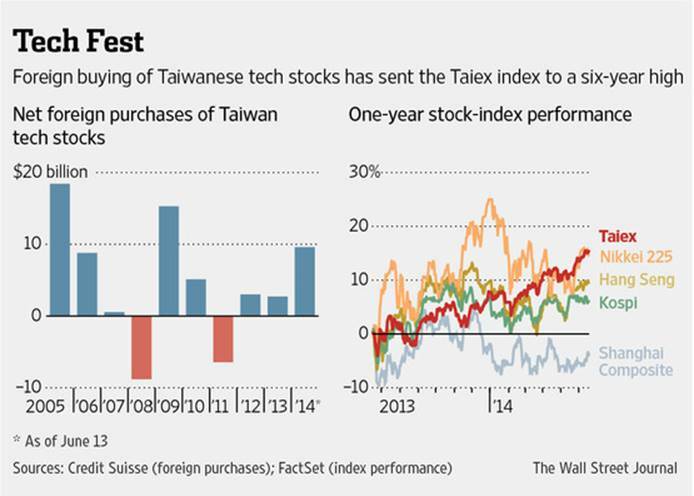 “Taiwan’s tech stocks are not expensive from a valuation point of view. Foreign funds are expected to keep flowing into Taiwan stocks and push them to rise further,” said Yonghao Pu, UBS UBSN.VX -1.61% chief investment officer for North Asia. Taiwan is also benefiting as money managers retreat from China, where growth is slowing, and Japan, where stocks are down 5.7% this year. Of course, this year’s rally has made the island’s stocks less inexpensive, and But some say the big technology companies are vulnerable as they compete on cost. “The market has done well recently and is not cheap,” notes Matthew Vaight, emerging-markets fund manager atof M&G Investments, which has over $400 billion in assets under management. It is underweight Taiwanese stocks, meaning it has less invested in them than called for by the benchmarks against which it tracks its performance. “Taiwanese companies need to work harder on innovation to develop competitive and product advantages that enable them to keep more of the value from the goods they produce,” Mr. Vaight said. For now, though, many see further room for stocks to rise. There is even speculation the government will buy stocks ahead of November municipal elections to sustain the Taiex and keep sentiment regarding the economy strong. Simon Liu, deputy chief investment officer at Yuanta Polaris International Securities Investment Trust, Taiwan’s biggest local fund house, expects the Taiex to hit 10000 by the end of this year.